I am studying disease progression in plant leaves and I am trying to estimate differences between a wild-type and a mutant plant. To achieve this I am using the proportion of healthy pixels in images of plant leaves. Due the type of data I decided to analyze it using gam modeling and beta regression to determinate if the plant genotype has an impact in the disease progression. 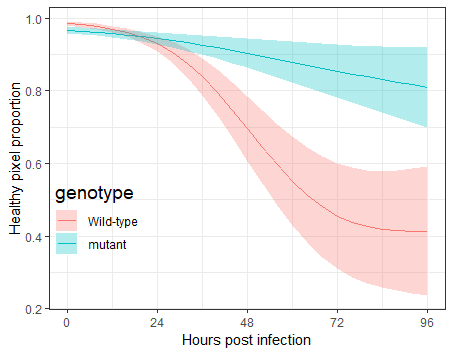 So I created two models, one base model with my response variable (size) as a function of hours post infection (hpi). I considered hpi and leaf_id as random factors. All good until here, except when I tested the goodness of fit I did not get any significant p-values even though AIC value improved a lot. Do you think there is really not difference between the genotypes or maybe it is incorrect to use anova when one use beta regression? I wouldn't trust the p-values from the multi-model form of anova.gam(). Reading ?anova.gam Simon gives plenty of warnings about using this, although in the direction opposite to what you see here. This decomposition will fit a smooth (s(hpi)) for the reference level and a "difference" term relative to the reference level for each other level. This is like the default contrasts in lm() where the intercept is the reference level and the model contains other terms that are the difference between the levels and the reference level. Then summary(m1) will give you a test directly for a difference between the two. Not the answer you're looking for? Browse other questions tagged r mixed-model gam beta-distribution mgcv or ask your own question. Why normal r.squared and fitted values are not the same when computed manually? Why are p-values often higher in a Cox proportional hazard model than in logistic regression? Can you extract AIC values in robust linear regression and use these for model selection?